ONGOING STATUS: Pathology Report confirms non-cancerous Lymph node, patient alive and well. In early 2011 Mr Porter noticed two lumps that had grown in size within a two month period. He then was diagnosed with Naso Pharyngeal Carcinoma with extension to the Lymph node of the neck. His local doctors in the United States of America recommended a variety of treatments such as an operation, Chemotherapy and Radiation. 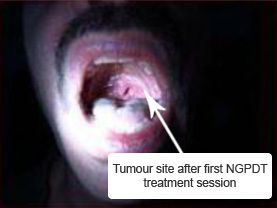 After looking at his treatment options, the patient immediately travelled to Guangzhou China to receive 3 full course treatments of NGPDT. Patient started his first treatment in late April 2011 which was one month after an approxiamate 3 months tumour growth time. Before treatment the tumor was difficult to see in the upper rear section of the mouth but after a first light treatment the cancer could easily be seen due to change of appearance and color to a “milky white”. NGPDT Photosoft Agent was proven to be highly selective, and only accumulated in tumor sites leaving healthy tissue unaffected. Ultra Sound was conducted before and after first 8 day treatment course, images were taken to show any progress/deterioration of tumor site of the neck. The ultrasound revealed the lymph node of the neck had changed from a solid hard state to a liquid mass. Patient experienced inflammation to the lymph node of the neck showing a successful immune response. 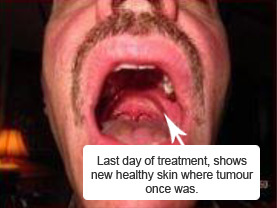 The cancerous area of the mouth showed new fresh skin cell growth in place of the tumor site. After 3 full course treatments the patient’s neck was swollen, patient was concerned so biopsy was conducted on patients arrival back to the U.S. Pathology report showed inflammatory cell response and macrophages (the cells that rid the body of debris from fragmented cells). No cancer cells were detected in the pathology report. Biopsy taken was a fluid sample of approx. two(2) cc’s of fluid taken from the left lymph node which was previously swollen with cancerous tumour. Pathology report give Benign or non cancerous lymph node prognosis, however the doctor reveiwing the report made a statement “still concerned about the possibility of persistent cancer. I recommend we try radiation”. This is a typical reaction of doctors that don’t understand PDT even though the pathology showed no cancer cells. General Medical practitioners are often out of touch with breaking medical procedures as clearly shown by this practitioners statements. Patient has successfully avoided radiation or chemo therapy due the success of his NGPDT treatment. A future CT/PET scan will be completed at a much later date to confirm no cancerous metastasis. The reason for the long interval recommended is due to CT/PET scans not being able to distinguish the difference between general inflammation and tumor tissue… Hence a perod of time is required for the body to repair and inflammatory response to complete.